Touring the backstage of the Opera House at the Kennedy Center for me was rather like being a very small mouse in a very large cheese shop. I’ve been backstage at many theaters, but never one as massive as this one. 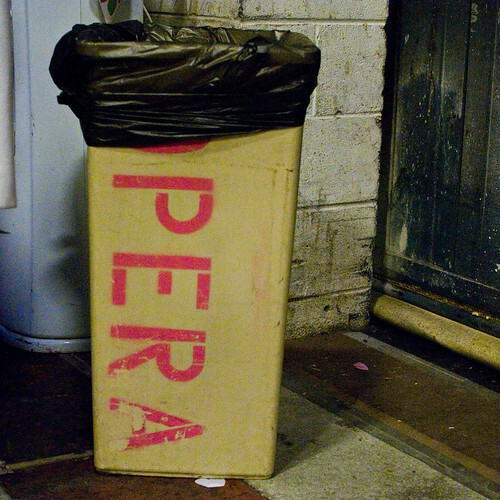 Photographer Brian Mosley and I joined a private press tour minutes before a Washington National Opera performance of Madama Butterfly earlier this month, and there was an eerie quiet backstage. We were in the proverbial calm before the storm. Technical professionals in black were moving about, readying the stage, and it reinforced just how much goes into a production of that caliber and size. First off, the stats. When I say the Opera House is massive, I’m not exaggerating. The house seats 2,219 patrons. 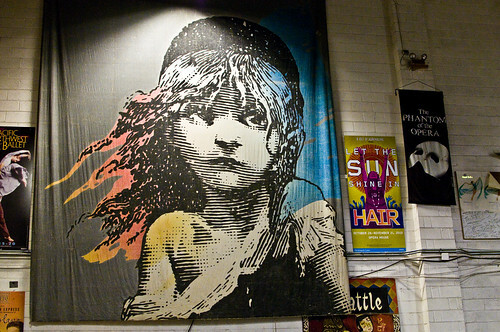 The stage is 100′ wide by 70′ deep by 100′ tall, with wing space of 50′ on each side – you are also dwarfed by the backstage stage space as two huge fire doors the width and height of the stage, located stage left and upstage, allow for enormous pieces of scenery to be moved on and offstage. I am going to run out of adjectives to describe size, so just trust me when I say, um, it’s big. The Opera House was built in 1972, and its resident company is the Washington National Opera. 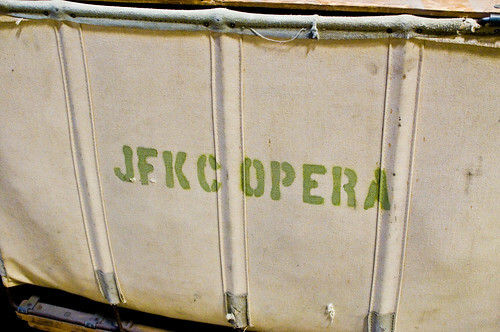 It’s worth noting that the WNO pays the Kennedy Center an annual rent for the use of the stage and receives no funding from the Kennedy Center – a fact which surprised me. The WNO still needs extra space to operate. Administrative offices are located a block away, and the Washington National Opera Studios are housed in a facility in Takoma Park, MD built in 2000. The studios contain the rehearsal spaces and costume shop. The WNO itself has been in existence since 1956, and since 1996 has been under the direction of famous tenor Placido Domingo (who conducted the performance I attended, a nice thrill, though I didn’t get even a glimpse of him backstage). One of the most striking aspects of the backstage tour, besides the sheer enormity of the space itself, was the cuing system. Performers are cued from the wings by colored light bulbs which flash like traffic lights to indicate when it’s time to go onstage. This method is used because the sound of the music traveling from the orchestra pit to backstage is delayed due to the speed of sound – in other words, by the time you hear the bars before your entrance, your entrance time has already passed! So the stage manager, in addition to being on headset, is also viewing both the stage action and the conductor through an elaborate video board, making them an operatic traffic cop. This also means it’s essential for opera stage managers to be able to read music. The WNO employs a full-time staff of 70 people, with an additional 700 part-time and contracted staff (including the artists, musicians and production staff). There are 61 tenured musicians and sometimes up to 42 choristers per production. There are six productions in the 2010-2011 season, with 45 performances. The average cost per mainstage performance is $405,000 – and that includes all artist fees, rental fees, promotion, production and administrative costs. With an annual attendance of 101,000 audience members and 35,000 at community and outreach events – I wasn’t kidding, big – it’s an incredible undertaking. Not only was I moved by the backstage tour and the stats on the WNO, the performance I saw of Madama Butterfly was truly beautiful and inspired me to see more of our nation’s opera company. If you are between the ages of 18 and 35, you can join Generation O, the opera’s outreach program which encourages younger patrons to attend through specially-priced tickets and special events. They even have their own full season subscription program called Series O. Next up for the WNO in May is Gluck’s Iphigenie en Tauride with Placido Domingo himself, and Donizetti’s Don Pasquale featuring the WNO debut of James Morris. September sees the passionate classic Tosca, with a live broadcast – “Opera in the Outfield” – at Nationals Park. Touring backstage gave me a new appreciation for the extremely hard work that goes into putting on the opera. We’re lucky to have WNO here in DC. Be inspired by more of Brian Mosley’s backstage photographs of the tour. The Washington National Opera’s ticket office is located at the Watergate Complex at 2600 Virginia Avenue NW, Suite 301, Washington DC 20037. Closest Metro stop: Foggy Bottom/GWU (Orange/Blue lines). For more information call (202) 295-2400 or 1-800-USOPERA.